GET THE MOST Out of Church Services! How much do you get out of Church services? Do you remember what God's ministers preach from week to week? Have you really been moved by inspired preaching? Read this article carefully and profit more each week. WEEKS, months, maybe years have gone by since you began to attend Sabbath services to hear God's called and chosen ministers preach His Word. Have you just been warming a seat — occupying space? Or have you eagerly been searching for knowledge, inspiration, even correction out of each and every sermon and sermonette? Far too many have failed to realize just how valuable even ONE sermon can be. Are you among them? Why do you go to Church anyway? Ask yourself these questions NOW! We all know God's Church is leaping ahead in phenomenal GROWTH every single year. It actually doubles in size, scope, and power every two and two-thirds years. It multiplies eight times over in eight years. There is nothing else like it in the world today! And the local churches ALL keep pace with the worldwide Work! Many of the men being ordained are Local Elders who have never been to Ambassador College. They have grown and developed in their local church areas through the Spokesmen Clubs and through the direct training received from the ordained ministers who pastor the churches. Attendance in all local churches increases monthly. In some areas so many people have been converted we have had to create two congregations from what was formerly just one. Physical growth in the last few years has been phenomenal. The Church of God today has TWO really big commissions. FIRST — to preach and publish the Gospel around the world. SECOND — to "feed the sheep." Christ intended that those who would hear and heed the warning message — who would repent of their ways — should be fed and nourished SPIRITUALLY. They are to enter the Kingdom of God to be kings and priests with Him and to bring the Truth of God to millions who have never before understood. Years ago, Mr. Armstrong learned that if the converted and baptized members of God's Church were to grow, there must be MINISTERS to lead and teach them. AMBASSADOR COLLEGE was the answer! In 1947 this active training program began. And from one local church in 1948 when Mr. Armstrong was the only minister, there are now over 200 local congregations, not just in America, but around the world. Well over 150 of these churches are in the United States. The average weekly attendance is now around the 300 mark in each of these local services. Just think, only a handful of people attended regular Sabbath services in 1948! Why do you attend church? 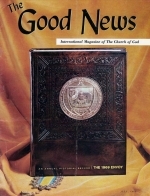 All the brethren keep pace with the growth in God's Church through the pages of The GOOD NEWS magazine. All members of the Church are kept abreast of changes and advances through Mr. Armstrong's Co-worker letters. But are you attending church as often as you can? If you are attending regularly — WHY?? That's right! You drive 100 miles or more to hear — God's ministers preach. Putting it in that light makes it seem like it could be a pretty important part of your week, doesn't it! Are you really getting WHAT YOU SHOULD out of the sermon? Here's how to get the most out of each service. Recently in one of the local congregations in the Big Sandy area, I passed out a sheet of paper to all of the members of the church congregation. I specifically asked that no one put his name on the paper. This was to be a test or a survey to find what the congregation had been doing in recent weeks. One of the questions on the test asked how much time had been spent in personal Bible study and personal prayer prior to church services that afternoon. This particular congregation has an afternoon service which would allow all members of the church sufficient time every Sabbath morning to spend the much needed time in prayer and study. Far too many people had not prayed one single minute prior to church! Many more had not studied so much as one single verse of the Bible before coming to church. This makes me wonder how many brethren around the world are coming to church simply to "hear" God's ministers preach? In order to obtain the absolute maximum from church services, you MUST study and pray before coming to services. The Apostle Paul wrote the Evangelist, Timothy, in II Timothy 3:16, "All Scripture is given by inspiration of God and is profitable for doctrine, for reproof, for correction, for INSTRUCTION IN RIGHTEOUSNESS." The very reason for attending church services is to gain knowledge of God's ways, being instructed in doctrine and in the Word of God, or being reproved and corrected to live more like Christ. But how many pray for this correction and instruction prior to coming to church. Certainly, the opening prayer in church services should ask God's inspiration on the minister and upon the learning of the congregation. But how much more would you personally get out of church services if you were praying effectively and fervently before you leave your home? It is also amazing how many people have a tendency to be drowsy and sometimes even sleep in services. Mr. Armstrong has jokingly said that those who fall asleep must be plagued by a "sleep demon." It seems in every local congregation there are those whose eyes roll back, eyelids droop, heads nod down on their chests for nearly the entirety of the sermon. I am sure there is not a single minister in God's Church who has not experienced this problem in his congregation. It's truly amazing some would be willing to drive the distances many do just in order to sleep away a portion of the morning or afternoon. It would seem home, and the comfort of one's own bed or couch would be much better than sleeping sitting up — and that without even a headrest. Seriously, in order to really grasp the sermon and to catch many of the fine points and details you must be totally rested and alert. First and foremost, the evening prior to services be sure you GET A GOOD NIGHT'S SLEEP. When God created the Sabbath, "On the seventh day God ended His work which He had made; and He RESTED on the seventh day from all the work which He had made. And God blessed the seventh day, and sanctified it: because that in it He had rested from all His work which God created and made" (Gen. 2:2-3). The Sabbath, in addition to being the day on which we worship God, is a day of rest and physical rejuvenation. Sabbath services are only a small portion of the twenty-four hours. This type of physical rest is necessary, and certainly Friday evening, above all nights of the week, should be a night for proper sleep and rest. Many must rise early in the morning to travel the distance to church. If this is your case, be doubly certain of a good night's sleep so that you are not drowsy and sleepy for church services. If you find, due to circumstances or weather, that you are drowsy, bring a thermos of hot coffee along with you in your car and drink a cup of coffee just before church. Find out what's making you sleepy, if this is your problem, and correct it. Don't let precious hours of your life, when you are receiving personal instruction from God's Word, go by while you are too sleepy to grasp it. The average "Christian" in today's modern world of churchianity goes to church because it is a social obligation. Millions of people who attend weekly Sunday services go only because it is what they were taught to do, what their wives, husbands, or parents expect them to do, or because it is expected of them for business reasons. The mere form and ritual, the usually very boring sermons, mean absolutely nothing. When you began to attend church services in God's Church, you notice a vast difference in the form and ceremony, as well as the delivery of the sermon. The sermon was the MAIN REASON for going to church. The beautiful choir performance, the fine building, ceremony, and Bible response reading did not prevail in God's Church. The whole center and focal point of every church service IS THE SERMON. Therefore, you should be ready and alert after praying and physically being ready to really receive some instruction or correction. Another very surprising factor in not getting the most from church services, is not knowing how to use the Bible to follow along with the minister. At first, even bringing a Bible to church might have sounded strange to many. Again, millions of church-goers would no more think of taking a Bible to church than they would think of flying by flapping their elbows. It's amazing what our modern world of Christianity is really like. However, it didn't take longer than a Sabbath or two at church for you to realize that all the brethren at church services follow diligently along in their Bibles. But is everyone really getting the proper benefit out of following along? First, be certain you have memorized thoroughly THE BOOKS OF THE BIBLE. After having memorized all the books of the Bible, practice turning to various books as they come to your mind. Husbands and wives can sit down together and call out books to each other to be looked up until they are familiar with the Bible order. I am sure you have all experienced a minister's calling out and quoting a certain scripture, turning to it to read it, and then turning to another scripture in another place in the Bible before you have even found the first scripture. By the time you found the first scripture and put a note on it and then turned to the second scripture, the minister had gone on to a third or fourth scripture; and you were hopelessly behind. Being thoroughly familiar with your Bible is another MUST in really getting the most out of church services. An additional need for really knowing your Bible is your local Bible Study. You should know the theme and context of most of the Bible. I am sure you have all read a good book or a novel and you can well remember the entire story you read, yet how many people today really know the stories of the Bible. How many people know the central theme of books like I Corinthians or Ephesians — or the basic order of events through I Kings? If you are regularly studying your Bible and learning what it is about, when a minister refers to a certain section of the Bible you will be able to readily turn to it and be familiar with much of the material that is being discussed. Of course, many new and interesting points are going to be brought out each Sabbath — you can not possibly remember everything that is discussed, which brings us to another important point. Another very unusual practice in the Church of God (at least something you thought was very unusual at first) is the habit and practice of bringing a NOTEBOOK and PEN to services along with the Bible. It probably seemed strange to you at first, but each time a minister made a particular point or quoted a certain scripture in the Bible, everyone's head immediately looked down at his lap and people wrote down major points and scriptures in the form of note-taking. But it probably didn't take you long to see the advantage in this, and certainly it is a very important part of each and every church service in getting the most out of the sermon. Since most of you now have been going to church for some time, you have probably established some sort of habit of note-taking. But here are a few pointers which might be of value to you. First, be sure you have a notebook which you use exclusively for taking notes at Sabbath services each week. Be sure that you have it with you every Sabbath so that you can keep notes all together in order. Second, be sure you get major points written down in your notebook — but do not worry about getting every word. Too many individuals try to get every little fact, practically every word the minister has to say. I know there are even some who take down the entire sermon in shorthand. Of course, one who is trained in shorthand is probably able to hear and comprehend what is being said, as well as getting notes down. Most people, however, are not proficient enough in really grasping what they hear while they write things down on paper. Most people hear a thought and then must concentrate on that thought while they are writing in their notebook. Consequently, many lose large portions of sermons because of taking too many notes. Learn to take down notes that are vital and important to fulfilling the information necessary to make a complete set of notes. Take the scripture references and major thoughts down on paper. Special points that you have not known before, or that may be new and different to you, should certainly be written down for future study. Both extremes can be harmful. It is certainly encouraging for every minister to see individuals writing down main points being made at each sermon. However, it can be equally as discouraging if every head is down and buried in a notebook busily scrambling to get every thought that is brought out. A properly moving and inspiring sermon needs a great deal of eye-to-eye contact between the minister and the congregation. The reaction and interest of the audience is a VITAL PORTION of every minister's effectiveness. So, learn to take notes, but learn to take them properly. Here is a much neglected tool in really grasping and remembering sermons. I fear it is much too often the practice after church to busily begin talking about everything from soup to nuts, which should not be discussed on the Sabbath. Very seldom is the sermon ever mentioned. It is easy to discuss what has been going on all week, major news items, or just general gossip. Every student at college knows that a great percentage of material which has been gained in a lecture is lost within a few hours after it is heard. A quick and thorough review of material covered is an important tool in remembering what you have been taught. A good review of the sermon by DISCUSSING IT with other church members at the conclusion of services will solidify and cement the thoughts and main principles of the sermon into your mind more than any other one thing you can do. We are all brethren together in God's Church. There is certainly no reason for anyone to be bashful or shy or awkward about discussing the sermon. After all, the minister has been discussing the subject for an hour or more, prior to the dismissal of services. Why then should any be embarrassed or unable to discuss the subject of the sermon each Sabbath. If you begin to put this into practice, you will find more and more you will be able to retain and REMEMBER so much more than you had previously been able to. Review will really cement what you have learned into your minds and get it down where you will use it. All the note-taking in the world will do you no good if you do not review and STUDY during the week. Perhaps you can work a sermon review into your family Bible study period about Monday or Tuesday of the week. That way each member of the family will be able to contribute thoughts and ideas so each one will get a good review. If your family is not converted, then study on your own early in the week. This way not too many days will pass and the material will be fresh in your minds and the review will profit you more than if you wait until Thursday or Friday to study last week's sermon. As you review the highlights of the sermon keep a red and blue marking pencil handy. During the sermon you will probably have very little time to mark the scriptures or to write a note or comment in the margin. But don't let important points escape you. As you study and review, mark the scriptures of importance and WRITE BRIEF NOTES IN THE MARGIN of your Bible which will help you explain the verses whenever you need the information. Brethren, many have let hundreds of important hours go down the drain because they have failed to apply these principles. Nothing in this article is "new" or hard to understand. But every point is vital. Pray even more for God's minister to be led by His Spirit and to be even more inspiring. Then do all you can to get THE MOST out of church services!